Mix some ricotta and some grated parmesan and beat them until you obtain a creamy mousse. Salt and pepper if needed. 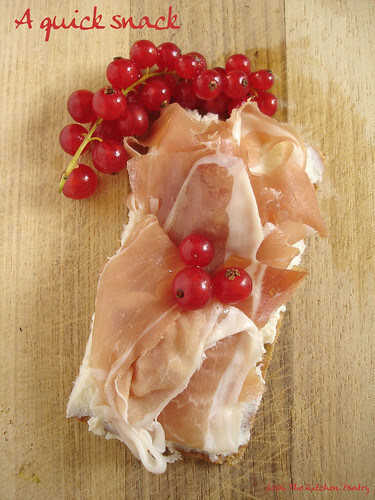 Spread it over a Wasa crisp bread and cover it with 2 slices of Parma ham. Looks good. I haven’t had parma ham, but I hear it’s heavenly. ma…Ecco…Senti Pip…Come dire…Dovrei rispondere in inglese? !